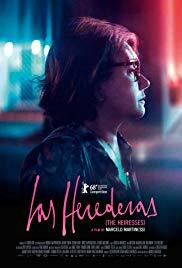 Blanched of hue yet rich in texture and drenched in feeling, Marcelo Martinessi's The Heiresses is a subtle, powerful exploration of the changing nature of class, repression and desire in modern Paraguay featuring a stunning central performance from Ana Brun. Brun's fifty-something Chela is inert; a product of a gilded age now fading, she watches as her family home disintegrates, her possessions sold to a procession of hawkish women who cast a cold, appraising eye over her life. When her long-term partner Chiquita is sent to prison for fraud, Chela finds herself even more adrift, until a side-gig driving her elderly neighbours introduces her to the younger Angy, who ignites a long-forgotten passion that, for Chela, is both terrifying and exhilarating. Fronted entirely, and remarkably, by a cast of women – men are seen fleetingly, out of focus, as inconsequential background noise – The Heiresses does not take great pains to make any kind of feminist point. Instead, this is simply the story writer-director Martinessi wishes to tell, and he does it with an understated approach that allows the performances to shine and reminds us, joyously, that the female over-50 experience means a great deal more than baking and book clubs. There's wider commentary to be found, too, about the changing face of Paraguay: the ageing elite hanging on to their traditions along with their pearls, and a new, fluid generation who have learnt to take each day as it comes. And yet, this is no overt political statement. So much is left unspoken; years of repression and regret are signified in Chela's slumped shoulders and resigned expression, which are slowly replaced by wistful glances and a tentative smile that lights up her face. Cinematography, from Luis Armando Arteaga, ranges from the beige tones of Chela's crumbling home to the colourful cacophony of Chiquita's overstuffed prison, full of women who have killed husbands and lovers in the hope of a better life. The Heiresses is not about an explosive midlife awakening but a steady unfurling; it is a journey of self-discovery that unfolds over languid cigarettes, cheap sunglasses and a gradual realisation that it may never be too late to seize the day.